Need a custom size? FoldedColor understands the importance of custom packaging. 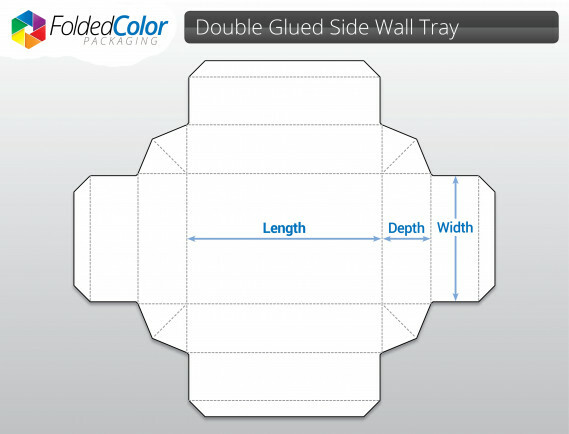 Our Double Glued Side Wall Tray can be sized to fit your product with your specifications. This style is a perfect option for machine filling or for filling by hand. This tray is glued for easier assembly and offers a cleaner look. Two of these trays can be used together as a lid and a base. Your packaging does so much more than just hold and protect your product; it makes consumers aware of your company and brand. Creating a look that is custom fit and tailored to your specifications is essential for your brand’s shelf appeal.